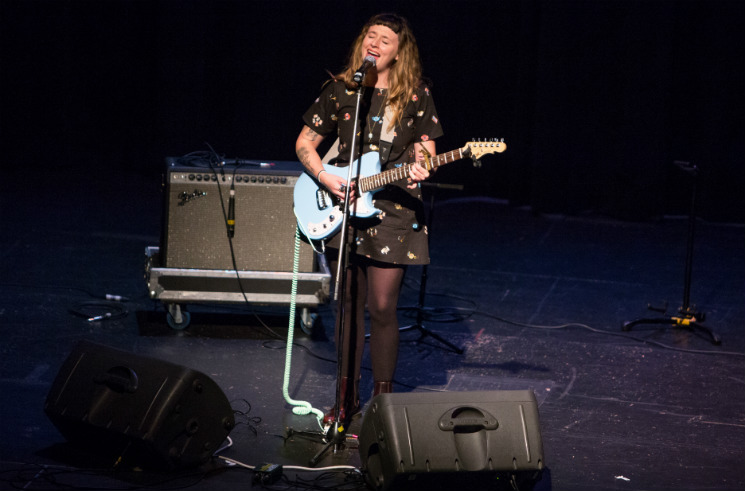 After making a concerted effort to record and tour as more than just a one-woman machine on Waxahatchee's last record, Ivy Tripp, it was a treat to see Katie Crutchfield bring her songs to Halifax for the first time — alone and armed only with an amp and electric guitar. As if the intimate, stripped down nature of the set wasn't conducive enough to elicit powerful emotions, the all-ages afternoon performance took place on the stage of a high school auditorium, leaving an innate and palpable sense of nostalgia hovering in the air. The singer-songwriter seemed tiny amidst the large, practically empty stage, but her gut-wrenching songs came out sounding crisp, brilliantly clear and commanding, filling the theatre and captivating the audience. After plunging deep into Waxahatchee's catalogue early on with American Weekend's "Grass Stain," Crutchfield shared a brand new song (presumably titled "Fade," according to the setlist left on stage). As heartbreaking as any song she's written to date, it told the story of a disintegrating relationship, culminating with Crutchfield's indignant croon of, "I stayed out of your way." Upon its end, she quipped, "Happy Saturday!" — playfully acknowledging the less-than-cheery atmosphere of a crowd gathered to "sit in a dark theatre listening to dark songs." No one seemed to object to dedicating their Saturday afternoon to such an activity, though, with the crowd eagerly applauding after each song, and awaiting the next one in rapt silence. They graciously received more American Weekend cuts like "Michel," the particularly poignant "Catfish," the recently-out-of-retirement "Magic City Wholesale," "Bathtub" and the eventual set closer "I Think I Love You," while Cerulean Salt's "Swan Dive" and "Blue Part II" also showed off Crutchfield's affectionate attachment to her musical past. Ivy Tripp fare like "Summer of Love," "Half Moon" and a decidedly less peppy "La Loose" were also trotted out, and joined by another new track titled "A Little More" — which, with a refrain of "I love a little more, I die a little more" certainly wasn't intent on brightening the mood. But despite the almost oppressive weight of Crutchfield's raw, heart-on-sleeve music, the honesty and empathy of it all managed to continually cut through the melancholy with glimmers of beauty. As she finished her final song, confessing, "I think I love you, but you'll never find out," onlookers were finally able to release their communal bated breath — though it may have taken a few extra moments for all eyes to dry.